Anne here, a catch up post for last week . . .
You are quite right, we couldn’t leave New Zealand without visiting Hobbiton, near Matamata. Even though it was pouring with rain, absolutely pouring, it was definitely worth a visit. You catch a coach from a central point, out into the Alexander family owned farm and immediately the rolling hills looked familiar to all Lord of the Rings and Hobbit film fans. Our group was made up of a few LOTR fanatics, a few brave souls who admitted to never having seen the films or read the books and the rest of us who had some knowledge. Highlights include lots and lots of Hobbit holes, the party tree and field, a free drink in the very cosy Green Dragon, the loan of a huge umbrella and a really excellent, cheerful and knowledgeable guide. They need to be incredibly knowledgable to satisfy the LOTR geeks but our guide also had lots of “behind the scenes” anecdotes and explained how some of the scenes were filmed. 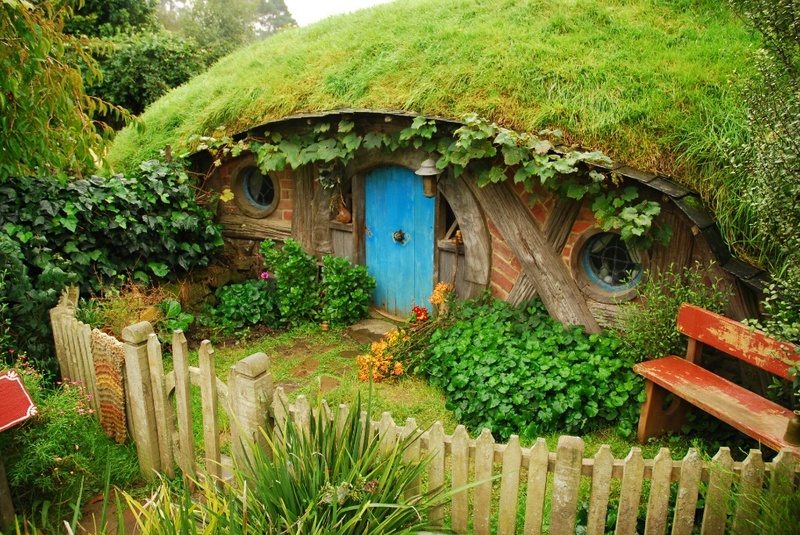 For example some of the Hobbit holes are large and some are smaller depending on the height of the actor and the size that they need to look on screen. Definitely recommended, although apparently it gets very busy in summer.